While cellphone manufacturers are busy making the fastest phones and the most powerful cameras, XPAL Power chose to be different. 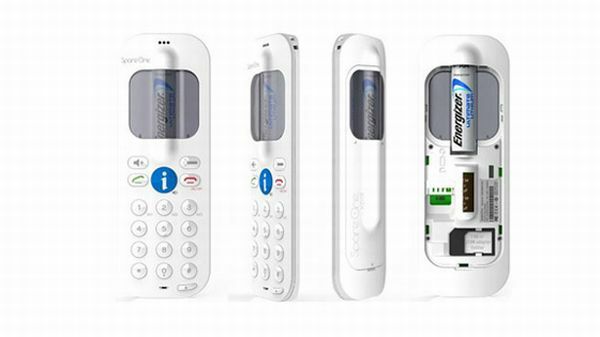 At MWC 2012, it presented a remote control like phone called SpareOne. The phone is sleek, light and minimalistic with no fancy features. It does not have a camera, a card slot, large touchscreen or anything like that. The phone has a basic monochrome display with standard alphanumeric keys. The catch here is the battery which is standard AA Lithium Ion battery. Not surprising enough? The manufacturer says that the phone can provide 10 hours of talk time and a stand by time up to 15 years using Energizer Lithium battery. The phone is very handy and can easily be carried in pockets, handbags, body gloves, etc. It allows you save contacts and schedule text messages. SpareOne also features a micro SIM adapter which works with iPhone. XPAL has also created power devices for many laptops. Powerskin, Energizer, Energi and go to name a few of them. Spare One is compatible with any other AA battery for use. Another great feature of the phone is one touch emergency call button. The feature works without the SIM too and transmits the location of the phone. You can keep this phone as a backup since it does not need any charging. This makes it ideal for emergency use. This phone has an integrated flash light and can retain up to nine speed dials. It is pretty easy to use hence, a great phone for elderly people. It is also handy for outdoor activities like sailing and camping. Being a simple phone that runs on AA battery, this would be a boon for rural areas where electricity is scarce. The phone does not need charge and whenever the battery runs out, you can replace it with a new one. The company has announced that the phone would be available worldwide in mid march for pre-orders. So the phone is a great deal with simplistic design and handy features. The phone has a flashlight and can accommodate any standard battery, hence you would love to carry it with you while trekking and hiking. The emergency call button can be used to make call in case of any emergency. What’s left to see is how the market reacts to this product. How to unlock cell phones? How Digital Cell Phones works?